On 15 March 2018, the Bagri Foundation in association with Soumik Datta Arts presents Back to the Blues, a world premiere concert exploring connections between South Indian music, North Indian music and contemporary jazz. The concert brings together for the very first time two of Indian Classical Music’s finest cross-cultural collaborators, legendary Carnatic vocalist Aruna Sairam and sarod virtuoso and composer Soumik Datta. Aruna Sairam is one of the most esteemed Carnatic classical singers, and this collaboration is her latest of many – including Sufi, jazz and Gregorian chant. She champions the status of female musicians, and the role of technology in classical music. Soumik Datta is a leading sarod player from the younger generation, and performs classical Hindustani ragas as well as working with musicians from Korea to Congo, and has organised a recent project with the Bagri Foundation, Tuning 2 You, to preserve unrecorded Indian folk music. He has recently reimagined and performed a new score to Satyajit Ray’s King of Ghosts (1968) with Cormac Byrne (see below). 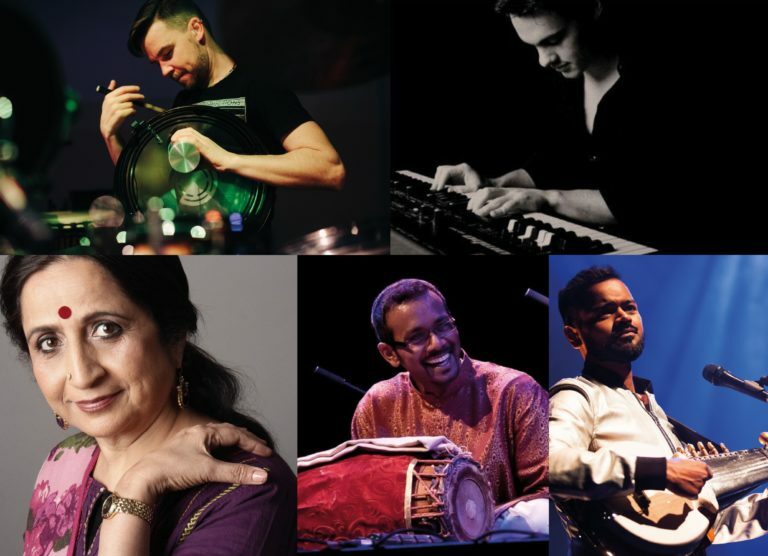 Aruna Sairam’s voice and Soumik Datta’s sarod will be accompanied by ganjira (South Indian frame drum), mridangam (Carnatic two-headed drum), bodhrán and piano, from a host of outstanding musicians from diverse musical backgrounds. Accompanying on piano will be Al MacSween, a pianist from a jazz background, who has collaborated with world-renowned artists from a staggering array of musical traditions, from Afro-Cuban, West-African, blues and jazz; to Indian classical music, Celtic folk, Arabic music and flamenco; to dub, trip-hop and electronica. Al has worked with artists such as Shankar Mahadevan (Shakti), Reem Kelani, Olcay Bayir and Sarathy Korwar. Al MacSween is co-founder of KEFAYA, an international music collective formed in the UK by musicians and activists. Cormac Byrne accompanies on percussion and bodhrán (Irish frame drum). His versatility has seen him in much demand across many genres, both live and in the studio, from Traditional Irish and Folk, World Music, Classical, Jazz and Pop. He has previously worked both with Soumik Datta on King of Ghosts and with KEFAYA, and acclaimed orchestras such as Scottish Chamber, City of Birmingham Symphony and Royal Liverpool Philharmonic. Pirashanna Thevarajah accompanies on kanjira, morsing, and mridangam. He has collaborated and performed with many of the world’s foremost Indian classical and contemporary musicians, including the late Pandit Ravi Shankar, Anoushka Shankar and Talvin Singh. Pirashanna performed as part of the world premiere of Sukanya, Ravi Shankar’s only opera, a co-production between the Royal Opera House, London Philharmonic Orchestra and Leicester’s Curve Theatre, supported by the Bagri Foundation and Arts Council England. He has also previously collaborated with Aruna Sairam: check out a video here.